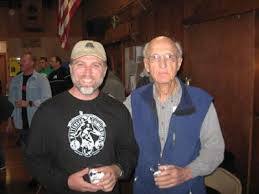 Albert “Al” E. Hodgson, the grand elder statesman and well-known historian of Willow Creek, California’s Bigfoot community, died Easter morning, April 1, 2018. Hodgson was 94 years old. Al Hodgson, June 4, 2000. 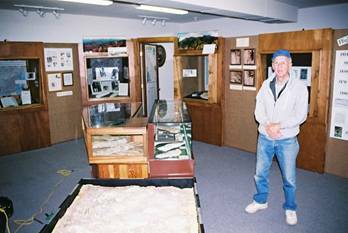 Hodgson had for many years been a volunteer at the Willow Creek-China Flats Museum, telling visitors of the many stories he knew of the early days of Bigfooting. 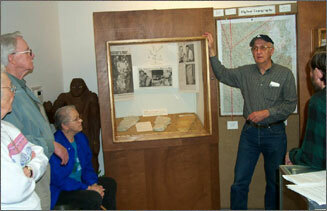 But long before those relatively recent periods of helping out at the Museum, Hodgson had been a figure that would talk to travelers from away exploring the area for Bigfoot information. He ran Hodgson’s Department Store, and that served as his base of operations. It was in August 1975 that I first met Al Hodgson, when I stopped by Willow Creek, on my cryptozoological trek from California to New England by car. 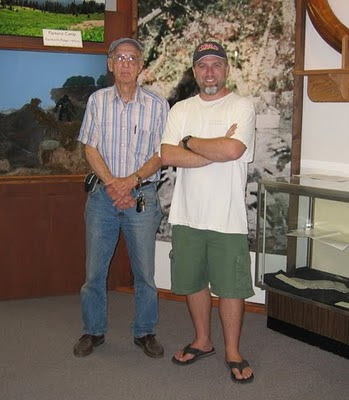 There was Al, at his store, friendly and sharing what he knew of Bigfoot with a stranger interested in the topic. 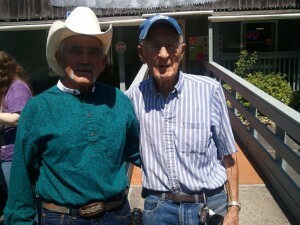 Al Hodgson and Loren Coleman in 2011. 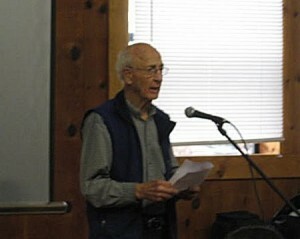 Loren Coleman photo. 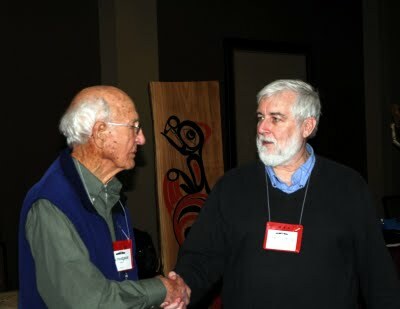 Years later, needless to say, when I met him again at John Green’s 2011 tribute conference in British Columbia, I thanked Al for his generous welcome to Bigfoot country. Now, along with Green, John Bindernagel, and so many others, Al Hodgson is gone too. 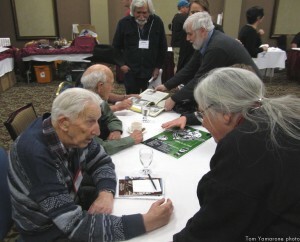 Al Hodgson, surrounded by other figures in Bigfoot royalty, autographs items for his fans, April 8, 2011. Loren Coleman photo. 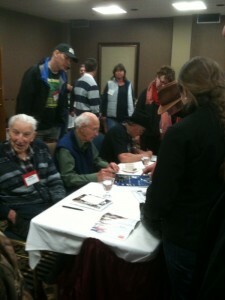 Around the table, John Green, Al Hodgson, behind Al is Bob Gimlin, Richard Klyver, Loren Coleman, and Joyce Kearney, April 8, 2011. Photos above and below, by Tom Yarmarone. 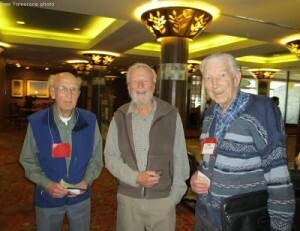 Al Hodgson, John Bindernagel, and John Green in 2011. Al Hodgson at the museum. 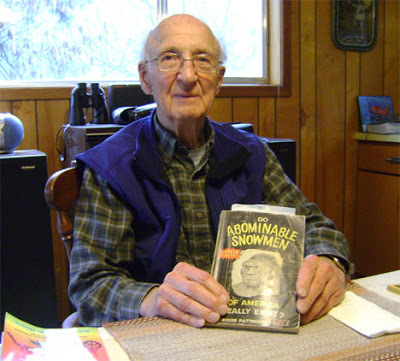 Al Hodgson, February 4, 2010. Steven Streufert photo. 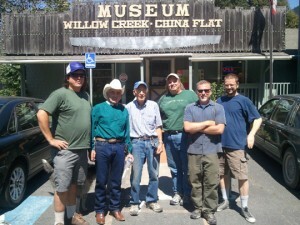 The Willow Creek-China Flat Museum, for years, has sold copies of Al Hodgson’s cast. 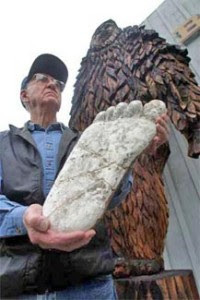 In August of 1963, Al Hodgson saw his first set of footprints in the ground which ended up convincing him that there really was something to the “Bigfoot” rumors that had been circulating in the area since 1958. 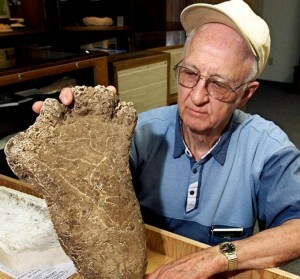 He and Betty Allen, one of the earliest chroniclers of Bigfoot sightings, drove to Bluff Creek to observe reported footprints and to possibly cast one. Ms. Allen needed a ride, and was concerned about going to the site alone due to the Native American stories about abductions of women by Bigfoot. 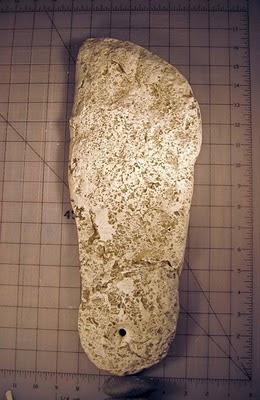 Interestingly, Al and Betty actually cast that footprint (rarely shown in the Bigfoot literature) which is now on display at the Willow Creek-China Flat Museum in Willow Creek, CA. 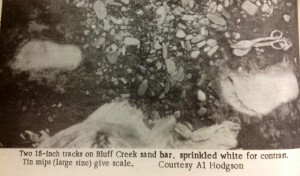 In October of 1963, Al Hodgson found another set of tracks at a location called the “Bluff Creek Sandbar.” At the time this sandbar was a short distance from the confluence of Bluff and Notice Creeks, but would later be washed away in the terrible flood of December 1964. Above and below, Al Hodgson, August 18, 2011. 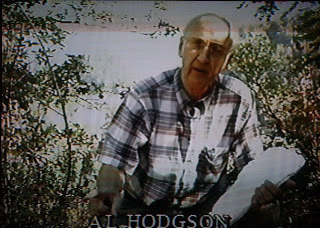 Al Hodgson rarely appeared in television documentaries about Bigfoot, but he was interviewed for the television series Ancient Mysteries (1994), hosted by Leonard Nimoy. [Francis Elifritz] “lived in Norris City, IL for a time and later moved to Albion, IL where Frances finished High School. After High School she attended Business College in Evansville, Indiana. 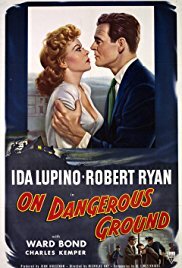 Returning to Albion she met her future husband Albert “Al” Hodgson. Al & Frances were married August 26, 1949 at the Edwards County Fair in Albion, IL. In 1952 they moved out to California where most of Al’s family was currently living. For a short time they lived in Santa Rosa eventually ending up in the Eureka/ Arcata area of Humboldt County. In 1954 Frances experienced her first earthquake. After the birth of their first son, Mike, they decided to build a house on property given to them by Al’s parents on the Hodgson Ranch in the Willow Creek area. About the time of the birth of their second son, Mark, they we’re in the process of opening their new store Willow Creek Varity. Frances operated the store while Al worked as a millwright for Carolina Cal, a local plywood mill near Salyer. Around 1960 they moved the store across the street (Hwy 299) to a larger building. From that point forward Al & Frances operated the store full time together. The store was flooded with 4 to 6 inches of water and mud in the 1964/65 flood due to a creek overflowing its banks and the mountain behind the store siding down up against the back of the building. Life changed quickly for the young family as electrical power was out for weeks and the new home was entirely electric with the exception of a wood fireplace in the living room. The family lived in the living room until power was finally restored. Frances cooked all the family means in the fireplace using a cast iron Dutch oven. Shortly after the flood property was obtained on the west end of Willow Creek on the north side of Hwy 299. A new much larger building was built to accommodate the growth of the store. In the mid-eighties the building was remodeled and a new section added to enlarge the store to the building you see today now home to the Willow Creek Family Health Center. The store was renamed at the time of the remodeling to Hodgson’s of Willow Creek and became a Ben Franklin franchise store allowing Al & Frances to carry an extended line of merchandise. The store was a big part of Frances’ life. While she took pride in the entire store there were two departments that she enjoyed most, Women’s Clothing and the Arts and Crafts. Frances and Ginger Burchard would travel out of the area on buying trips each year to purchase new lines of clothing for the store. Always attempting to find and purchase fashionable women’s clothing. The store had many hard to find items and customers came from all around the Klamath-Trinity Valley Area to shop. Many customers came from the coast often times commenting that the store carried merchandise that was hard to find elsewhere. Over the years there were many wonderfully talented and loyal employees two of which were Virginia North and Ginger Burchard. Virginia and Ginger worked for Al & Frances for many years and stayed with them right up till the end when the store was closed at the end of the year in 1995. Another big part of Frances’ life was her church. She was a member of the Willow Creek Bible Church and was involved in many church related activities such as Sunday School, Vacation Bible School and Christian Women’s Club. Frances often times would pickup or make arranges for kids to come to Sunday School and Vacation Bible School. In the days since Frances’ passing the family has heard many wonderful stories of how Frances touched their lives. Frances was also involved in Soroptimist International and the Willow Creek Fire Bells. She was one of the original organizers of the annual Bigfoot Daze celebration and generally active in her community. Frances is survived by her husband of 61 years Albert Eugene Hodgson, her son, Michael Hodgson and his wife Susan of Saratoga and their two children Nickisa and Kevin. She is also survived by her son Mark Hodgson of McKinleyville, her brother’s children Patrick Elifritz of Bokoshe, OK; Cathy Warren of Red Bluff, CA and her children Phillip, Michael, Kelly and Cameron; Kelly Marshall and her husband Carson of Oklahoma City, OK and daughters Tina and Amber and their son Carson III; and John Elifritz of Fulton MO. Frances loved Mike’s wife Susan as the daughter she never had. She very much loved her granddaughter Nickisa and her grandson Kevin. All of them had a very special place in her heart. Frances’ brother Jim died at the early age of 37 from complications related to an accident on an oil rig several years earlier. This death left 4 young children without a father who needed their daddy very much. While Frances couldn’t replace their Father she showed them love and devotion and tried to be part of their lives whenever possible. She loved each and every one of them and their children as well who were more like Frances’ grandchildren than nesses and nephews. Frances was the last surviving member of her immediate family. She was preceded in death by her parents Frank & Christine Elifritz; her sister Thea Mae Elifritz who only lived 16 days and her brother James Phillip “Jim” Elifritz….” Eureka Times-Standard, September 28, 2010. ALBERT AL EUGENE HODGSON Albert “Al” Eugene Hodgson went to be with his Lord and Savior on Easter Sunday, April 1, 2018 and is now rejoined with Frances. Al was born near Golden Gate, Wayne County, Illinois September 27, 1923 to John and Nellie (Brown) Hodgson. The first 9 years of Al’s life was spent growing up on his parent’s farm. They farmed two tracts of land, one owned by John and Nellie and the other by Nellie’s father. Due to the Great Depression of 1929 the farms failed and all the farm equipment had to be actioned off. In 1933 the family packed up everything they could fit onto two vehicles and with their German Shepherd Wolf in a crate tied to the running board left the rest behind and headed west to Humboldt County, California thinking there might be better opportunities to provide for the family in the Pacific Northwest. As a young man John Hodgson, Al’s father, had previously been to Humboldt prior to the 1906 earthquake and worked for the Hammond Lumber Company for a time before heading to San Francisco. 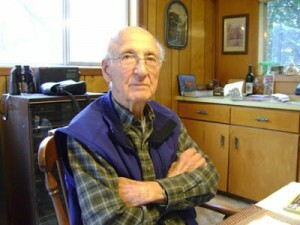 Within a short time of the family’s arrival in Humboldt County they made their way out to the Willow Creek area and in 1934 purchased what is now known as Hodgson Hill from William Toms Jr. Al lived on the ranch until war time and like many other young men enlisted in the service and served 5 years in the Navy. Al was stationed at San Diego Naval Air Station and latter served on the USS Kenneth Whiting and held the rank of Aviation Machinist Mate First Class. After returning home from the war Al traveled back to Albion, Illinois to visit with his sister Marjorie and worked in Albion for a time. While there Al met his future wife Frances Elifritz. Al & Frances were married August 26, 1949 at the Edwards County Fair in Albion, IL. In 1952 they moved out to California where most of Al’s family was living. For a short time, they lived in Santa Rosa eventually ending up in the Eureka / Arcata area of Humboldt County. After the birth of their first son, Mike, they decided to build a house on property given to them by Al’s parents on the Hodgson Ranch in the Willow Creek area. About the time of the birth of their second son, Mark, they we’re in the process of opening their new store Willow Creek Variety. Frances operated the store while Al worked as a millwright for Carolina Cal, a local plywood mill near Salyer. Around 1960 they moved the store across the street (Hwy 299) to a larger building. From that point forward Al & Frances operated the store full time together. The store was flooded with 4 to 6 inches of water and mud in the 1964/65 flood due to a creek overflowing its banks and the mountain behind the store siding down up against the back of the building. Life changed quickly for the young family as electrical power was out for weeks and the new home was entirely electric with the exception of a wood fireplace in the living room. The family lived in the living room until power was finally restored. Shortly after the flood, property was obtained on the west end of Willow Creek on the north side of Hwy 299. A new much larger building was built to accommodate the growth of the store. In the mid-eighties the building was remodeled and a new section added to enlarge the store to the building you see today, now home to the Willow Creek Family Health Center (Open Door Clinic). The store was renamed at the time of the remodeling to Hodgson’s of Willow Creek and became a Ben Franklin franchise store allowing Al & Frances to carry an extended line of merchandise. In the span of two weeks starting on Thanksgiving Day of 1957 there were two very devastating fires that destroyed most of the retail businesses in Willow Creek. A short time later the effort began to organize the Willow Creek Volunteer Fire Department and to create the Willow Creek Fire Protection District. Al was a charter member of the fire department and served honorably for 35 years. Besides the fire department and fire district more work needed to be done in the way of domestic water supply as well as water distribution for use by the fire department hence the Willow Creek Community Services District was born. Much hard work was done by Al and others in the community to obtain grant funding to build the original infrastructure enjoyed by the Willow Creek community today. The Willow Creek Community Services District honored Al in 2008 by naming the new water treatment facility after him. Al & Frances were active in their church and spend many happy moments with their extended church family which spanned over many years. Reviewing the church directories that were saved over the years it was apparent just how many wonderful people they had come to know and love all sharing their faith in God with one another. Al held many positions in the community but the ones he cherished most were husband, father, grandfather, uncle and mentor. Al was the last surviving member of his family that came out to California in 1933. He was proceeded in death by his parents John and Nellie (Brown) Hodgson, sisters and brothers, Marjorie Cowling, Carl Hodgson, Hazel Howard, Don Hodgson, Mildred Pettigrew, Dorthy Hodgson, Julia Chase and Jack Hodgson. Al is survived by his son Mike and his wife Susan Hodgson and their daughter Dr. Nickisa Hodgson and her husband Dr. Kaveh Zakeri and Mike & Susan’s son Kevin Hodgson who recently graduated from the University of Alaska Anchorage and majored in geology. 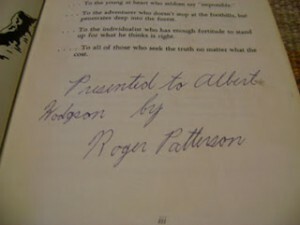 Al is also survived by his son Mark Hodgson. Both Al and Frances were much loved and will be sorely missed by their surviving family. Services will be held at the Willow Creek Bible Church Saturday, April 7th at 10:30 AM. Interment will follow after the service at the Willow Creek VFW Cemetery. Those wishing to make a memorial contribution in Al’s name may do so to anyone of the following: Willow Creek Volunteer Fire Department, Willow Creek – China Flat Museum or the Willow Creek Bible Church. Times-Standard. Deep appreciation to Steven Streufert for his information assistance.